Post-screening discussion with Ian Christie and Djurdja Bartlett. With a live musical accompaniment by Stephen Horne, featuring a theremin (a musical instrument invented in Russia during the 1920s). Aelita remains one of the most ambitious endeavours of Soviet Russia’s silent cinema, and a bold showcase of its avant-garde design. The film is perhaps best known for its wild cubo-futurist aesthetic flaunted in its otherworld sequences on Mars. 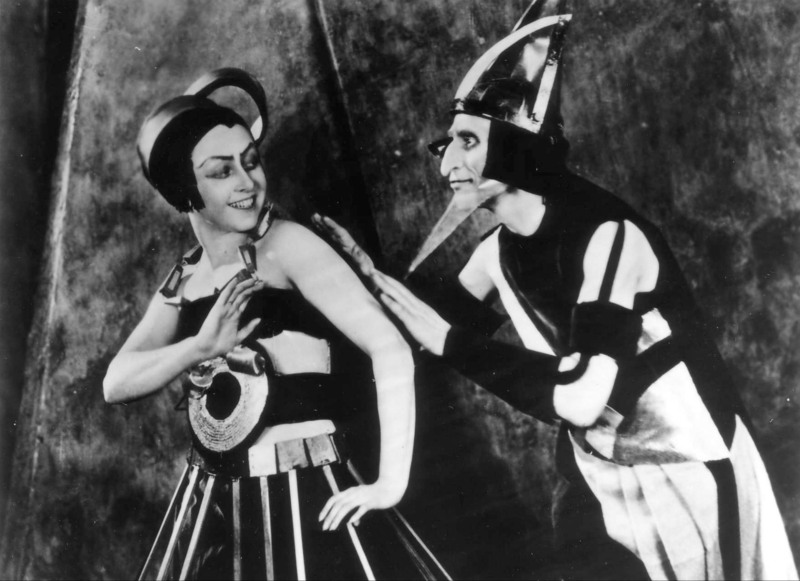 Here the angular geometric costumes and sets, designed by constructivist artists and designers including Isaac Rabinovich and Alexandra Exter, foreground hard, industrial materials such as metal sheets, celluloid and plexiglass. Complementing each other in a total look, both the costumes and sets form striking three-dimensional compositions of converging geometrical forms and material textures. As in many science fiction films after it, Aelita’s deliberate contrast between the Earth and an alien civilisation conceals a political message. The film is, in fact, less interesting as a science fiction fantasy than as a loaded ideological portrayal of the tumultuous reality of post-revolutionary Russia, with its nostalgia for the past and dreams of the future colliding in the uncertain present. Soviet Union 1924. Dir. Yakov Protazanov. With Yuliya Solntseva, Igor Ilyinsky, Nikolai Tsereteli. Costumes Alexandra Exter. Ian Christie is Professor of Film and Media History at Birbeck College, University of London. His books include studies on Michael Powell and Emeric Pressburger (Arrows of Desire, 1994), Martin Scorsese (2003) and the development of cinema. Djurdja Bartlett is Reader in Histories and Cultures of Fashion at the London College of Fashion. She is the author and editor of numerous articles and books on fashion, including FashionEast: The Spectre that Haunted Socialism (2010).